The only 2 states I flipped since then are in red. 367 – to – 171 — my electoral college prediction before the 2008 election. P.S. — This election, the swing districts in both (proportional) Nebraska and Maine will all go with the winner of the state. 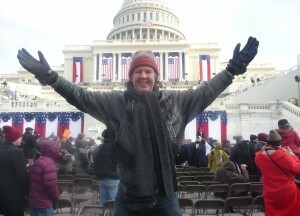 at the first Obama inauguration. Hey Mr. Smart Man – good for you! A second term for the Prez. Looks good! Am enjoying this election a lot. Looking forward to someone showing me how we get the House back, but may just have to wait until election night 🙂 Good work! People keep asking me about the landslide effect if there’s a massive Republican implosion. Even if that happened, the main state that would flip would be Missouri, then maybe Arizona, South Carolina, and one of the Dakotas. And that’s it. 380 – to – 158.